On the 23 May 2018, LawInSport will be hosting a half-day seminar on legal issues in football and a book launch of ‘Football and the Law (Bloomsbury, May 2018)’. The seminar is being held in partnership with Blackstone Chambers, the British Association for Sport and Law and Bryan Cave Leighton Paisner LLP. 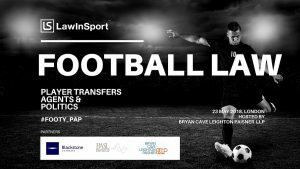 Following the seminar, the British Association for Sport and Law (BASL) will host a panel on ‘The life of an in-house football lawyer’. After the BASL panel guests are invited to join us for the official book launch of ‘Football and the Law’ and an evening of networking drinks in partnership with Blackstone Chambers. The event is kindly being hosted by Bryan Cave Leighton Paisner, Adelaide House, London Bridge, London, EC4R 9HA. 2.55-3.45pm: Regulating Intermediaries – what does the future look like for football agents? Football and the Law (Bloomsbury, May 2018) is the “first comprehensive review of the law relating to all aspects of football, including all of the main regulatory and commercial aspects of the sport”. Football and the Law has been authored by Nick De Marco QC with contributions from over 50 of the leading experts in the field. Attendees to the event will be entitled to receive an exclusive 15% discount when purchasing the book. The seminar offers 4 hours of self-accredited CPD. Notes from the panel discussion will be circulated to attendees following the seminar.